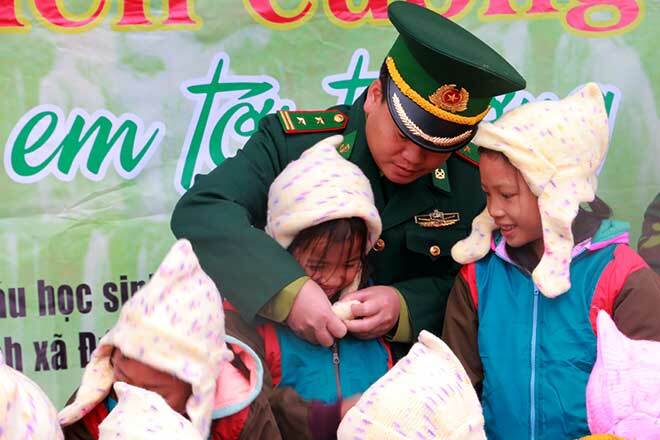 PSNews - The Youth Union chapter of the Border Guard Newspaper on December 15 in collaboration with the Coc Pang Border Station and the charitable group "Love for the Border" organized the program "Warm jackets for border children going to school" at the border commune of Duc Hanh, Bao Lam District, Cao Bang Province. 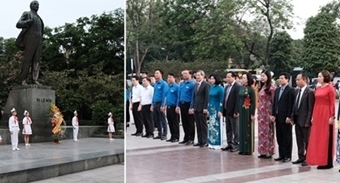 This was one of the activities to celebrate the 74th founding anniversary of the Vietnam People's Army (December 12, 1944-2018), 60th anniversary of the foundation day of the Border Guard Force (March 3, 1959-2019) and the 30th anniversary of the Whole-People’s Border Day (March 3, 1959- 2019). Duc Hanh is a remote border commune of Bao Lam District, Cao Bang Province with severe natural conditions. The commune has 18 hamlets and 9,000 hectares of natural land of mountains, and over 600 hectares of agricultural soil. Duc Hanh Commune has 946 households with more than 5,000 people, of whom, 60% is the Mong and Lo Lo ethnic minorities, and the remainders are the Nung and Tay minorities. The commune has 6 schools in high mountains, enrolling 315 primary students, 33 kindergarten students, who are living in extremely poor and difficult states. During the program, the charitable mission presented over 300 packs of gifts each worth 250,000 VND, including warm jackets, boots, socks, books, scarves, woolen hats and gloves to the local primary and kindergarten students. The mission also handed over 81 packs of gifts, including 10kg of rice, plastic buckets, soup powder and 300,000 VND in cash to 81 policy beneficiary families in the locality. 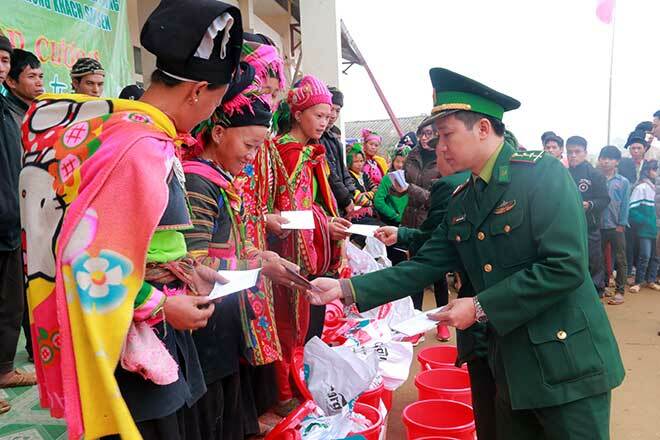 The Youth Union chapter of Border Guard Newspaper and donors also presented 28 million VND to Private First Class Vu Mi Quynh, a needy soldier of the Coc Pang Border Station; and presented 5 million VND to a household with 7 orphans in Duc Hanh Commune. The charitable mission also donated 3 million VND to the fund "Backing children to go to school" of the Coc Pang Border Station. The total cost of this program was over 160 million VND.